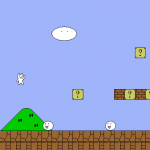 Syobon Action (also known as Cat Mario or Neko Mario) is a platform game with a similar gameplay experience as Super Mario Bros, except it’s more difficult and was written by a psychopath. We improved the SDL version and made a Windows port. Syobon Action for Windows (if you get a DLL error you need to install the VC2010 redistributables). Was tested on Windows XP, Windows Vista, Windows 7 and Windows 10. Syobon Action for Linux/BSD/Unix (contains the source code, you need sdl, sdl_image, sdl_gfx, sdl_mixer and sdl_ttf to build it). If you want to help building distro specific packages (eg. deb) feel free to provide them. Many thanks to Christian Birchinger for testing and improving the build. Thank you very much! Now I can play Syobon Action like a DOS game! Thank you so much for doing this and sharing it with us all! Love the game but it was really a bit too irritating having such a small window! Sounds like you have i it somewhat! Looks like an SMB version of I Wanna Be That Guy. Delightfully painful gameplay, but not too hard to see how it’s played correctly. English translation is rather unecessary. What do you press to make it a small window? It’s great, but the display seems to rotate 90 degrees counterclockwise automatically on startup. Is this a dll issue? Strange, it’s not supposed to do that. Do you have some screen rotation software running? No- but my computer is a generic Korean netbook, sometimes it does weird stuff. It works fine if I pre-rotate the screen 90 degrees clockwise 🙂 Great port! Love Syobon Action! Thanks! omg i loooooooove this game!!! my computer wont let me play 2 and 3 🙁 could you make those for windows too? How did you translate this game? Sadly does not work with fraps. Syobon Action use in the momment only GCC code which not works with Clang. Please solve these Issues with Clang.